Here there is no “student-housing” near the universities, because all of the students live with their families. If not, if they are going to university in a different city, they will more than likely live in a pensiona– a room rented from another family. I don’t think anyone can say definitively which is better—a more individualistic society or a more communal one. There are both positive and negative aspects to each. One observation I have is that the family-oriented environment creates a smaller gap between the generations. I think children understand their parents better and parents understand their children better, and I think they get along better because of it. I also see less sibling rivalry and less rebellion against parents, which I think has to do with the fact that you know you are going to be living together for a while, so you better learn how to play nice. Moreover, I think that Colombian kids act more mature than kids in the States, and I think that Colombian parents are more in-tune with their young selves. For example, it’s not that uncommon for a fifteen-year old to begin university. It’s even more normal for sixteen and seventeen year olds to begin university, while in the States it is almost always eighteen. I teach a class of high-school seniors, all sixteen or seventeen, and they are so much more mature and know so much more about the world than I or my friends did at that age. For me, the best is to see the “grown-ups,” the parents here. When I go out dancing until two o’clock in the morning, there are couples there in their forties, fifties, sixties dancing better and staying out later than me. One of my favorite moments in Barranquilla was in the weeks before carnavales. My school hosted a Fiesta de Polleras for all of the mothers and teachers of my school. 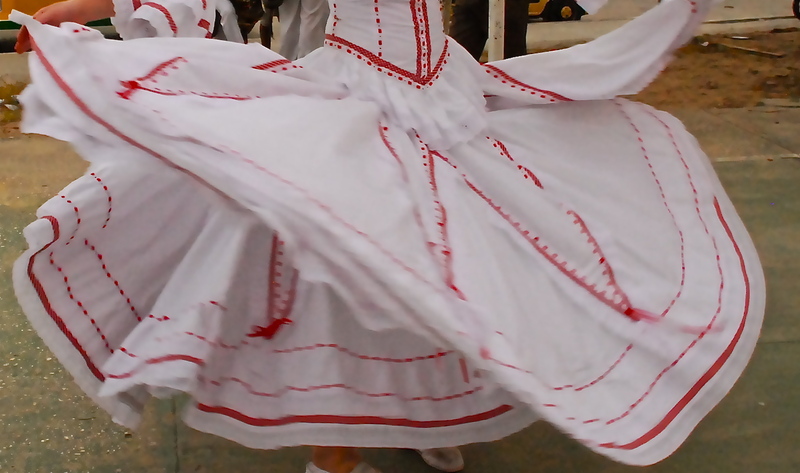 A pollera is a type of long, full skirt worn for a dance called cumbia, among others, that are performed during carnavales. One of the main bars in Barranquilla hosted the event. I went reluctantly, not really excited to hang out with a bunch of my kids’ mothers for the evening. In the end, I had so much fun. 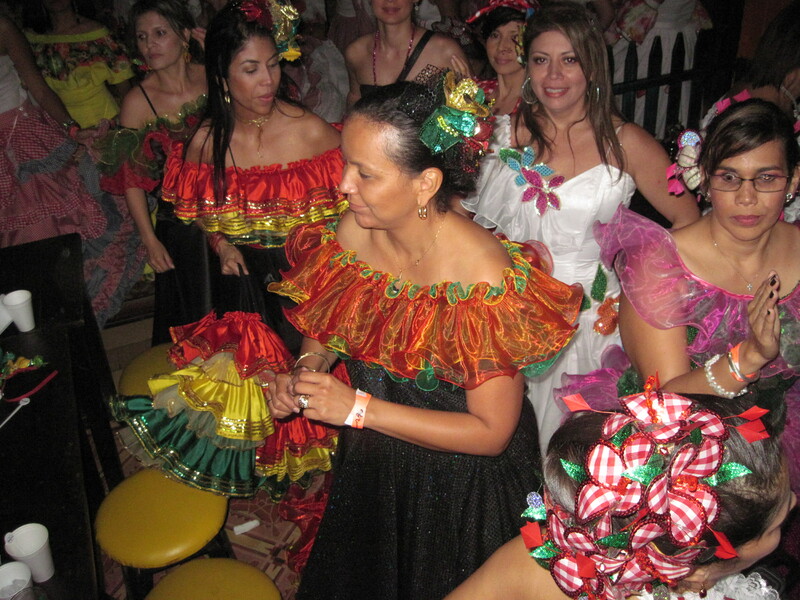 All the mothers went dressed up and danced like crazy, and not just to traditional Colombian and Latin music; also to reggaeton and hip-hop and songs like Gasolina, I Will Survive, and many others, and man, did they get down! They knew the words and were dancing on tables and were basically moving like any Colombian teenager. It was so great, and I could never imagine a school event like that in the US. The smaller generation gap and importance of family is also exemplified by prom in Colombia. I had the opportunity to go to a prom in Bogotá; you may find it strange that a twenty-three year old can go to prom here, but actually, the whole family goes to prom. Parents, grandparents, brothers, sisters, cousins, friends…anyone who wants to and knows someone who is going, basically. Can you imagine a prom with families there in the US? I find it difficult. And in Colombia, everyone dances, not just the graduates. Moreover, kids are happy to have their families with them at prom. I feel like in the US, a bunch of seventeen-year olds going to a school dance with their parents would be doing a lot of sighing and eye-rolling, while here, it is simply accepted. Another difference I noticed that I think illustrates the closeness between generations is that kids often call their friends’ parents by their first names. For example, in my classroom, all of my students called each other’s parents by their first names. In the States, however, I always called my friends’ parents Mr. and Mrs. (Last Name), unless it was a very close family friend. While I have no opinion on which I prefer, a more communal versus more individualistic culture, I feel very fortunate to have experienced both, at least to some extent. For me, there are good and bad aspects to both, and so, Dear Reader, I think it would do us all good to try to learn from one another. This entry was posted in Colombia, South America, Travel and tagged Barranquilla, Colombia, Culture, Family by Kate Caroline. Bookmark the permalink.